Overview: These are free and paid tools which will help you determine how large a competitor's traffic stream is, and which search terms are sending them the most traffic. Watch this video for a brief introduction to using the following tools. While their tool is a paid service, the above search box still allows you to get a great sampling of their data for free. 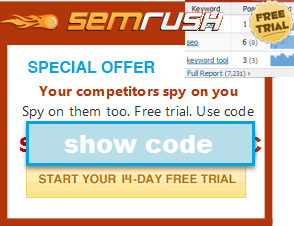 SEMrush is easily our favorite competitive research tool. We like their tool so much we also license their data to offer our paying subscribers a competitive research tool powered by their database. SEO Toolbar - Add useful marketing data (like link details, site age, site size) right at the top of your browser. SEO for Firefox - Import useful marketing data (like link details, site age, site size) right into Google and Yahoo search results. Alexa - shows traffic trends for competing websites. Alexa has a heavy webmaster bias that is nowhere near as noticeable at Compete or Quantcast. Here is an in-depth Alexa review & you can download a list of their top 1,000,000 websites. Quantcast - shows site traffic and demographic trends and details. Also allows you to download a list of their top 1,000,000 websites. Google Trends for Websites - free tool from Google showing traffic estimates, visitor country location, top 10 related websites, and top 10 related keywords. Only returns data for fairly high traffic websites though. Google also offers an Ad Planner, but it only shows data for sites in the Google display network. NetPeak Checker - desktop software which pulls in market research data from various 3rd party sources. URL Profiler - a similar service to NetPeak, which is a paid product & pulls in more data sources. SeoTools for Excel - free Excel spreadsheet with many SEO-related features baked into it. 90 DataGrabber - Excel spreadsheet which interfaces with the Majestic & SEMRush APIs to pull in competitive research data. Overview video here. While it is free, it requires you to have paid accounts at Majestic or SEMRush to fully use it. SEOGadget for Excel - another Excel-based suite of SEO tools. RankTank - a collection of Google Drive / Google Docs spreadsheets for common SEO functions like rank checking. There is also a simple SEO audit tool based on Google Docs. Archive.org - see how old a website is & what it looked like in the past. DomainTools - see Whois data and how many times a domain has changed hands. SEMRush - competitive research tool covering both AdWords & organic search results, adding data like keyword value and keyword volume to ranking data. In addition to tracking Google's global search results, they also track Bing & about a dozen different regional / country specific Google result sets. Full SEM Rush review here & we also secured a free 2-week trial code you can use here. SpyFu - shows terms that competitors are buying or ranking for in the organic search results. Some of their best features are: a visual monthly(ish) SERP snapshot for keywords going back for about a decade (so you can visualize how the search result layouts have changed as Google has entered more verticals and made the search results more ad heavy), unlimited data download (many tools cap your depth) & AdWords ad copy tracking. They also have a feature for seeing historical rankings of a site at a glance, and their tools track the US & UK markets. Here is an in-depth SpyFu review. SimilarWeb - Competitive research tool which offering a global data set consisting of keyword referrals along with upstream & downstream traffic data for websites with data on numerous international markets. Quite pricey. Jumpshot - tool by Avast which leverages their user data to create a similar offering to Compete.com or SimilarWeb. HitWise - similar to Compete.com Search Analytics, but costs about $10,000 and up. DataForSEO - credits-based platform which allows SEOs to track rankings, pull keyword click volumes & prices, and estimated traffic levels for websites. KeywordSpy - similar to KeyCompete, but with more data - including cached ad copy and affiliate data. Here is an in-depth Keyword Spy review. iSpionage - similar to KeywordSpy. Here is an in depth iSpionage review. SearchMetrics - offers SERP ranking data & link data. Provides historical ranking data, as well. Primarily focused on enterprise-level clients, but has a more accessible lower cost Essentials level. Trellian Competitive Intelligence - shows keywords that competitors rank for and keywords that send them significant traffic. View our keyword research tools section, or use some of the following free tools to get a view of their keyword strategy. Keyword Density Analysis Tool - finds common words and phrases on your site, or competing websites. Page Comparison Tool - tool compares the page titles, meta information, and most common two and three word phrases between different pages. Buzzsumo - highlights popular & widely shared content on social networks matching a keyword you search for, showing viral stories on Twitter, Facebook & other networks. View our link analysis section, or use some of the following free tools to get a view of their link strategy. Majestic SEO - link anchor index that allows you to download the link profile for any site...going thousands or millions of links deep! Open Site Explorer - similar to Majestic SEO, but with an easier to use interface and perhaps a few less filters. Database is not as large, but it also doesn't have as much outdated data as one would find in Majestic SEO's database. Competition Finder - tool looks at how many competing pages there are in Google's index that have your desired keywords in their page title and anchor text. Back Link Analyzer- free Windows based downloadable software allowing you to deeply explore through a competitor's backlinks. powered by the Yahoo! API, so it might be a bit spotty, but it is not bad for free. Tools to crawl through competing sites. Xenu Link Sleuth - Downloadable software which makes it fast and easy to find broken links on your site. Bing Ads Intellegence is a powerful SEM plugin for Microsoft Excel 2007, 2010 & 2013 which is quite remarkable. Google Traffic Estimator - estimates the number of Google AdWords ad clicks and bid prices for the top ad position. Google AdWords - if you bid broad match on competing brands you can track your ad impressions to see how much traffic they get. Google AdSense - if your competitor is running AdSense ads on their site you can run a site targeted ad to see how much traffic they are getting. Browser extensions which make it easy for you to access cool free SEO tools from anywhere on the web. SEO Book Gadgets - add free link analysis, competitive research, and keyword research tools to any web page or iGoogle. Google Toolbar Buttons - Allows you to add quick links to SEO tools and RSS feeds to the Google toolbar. They only works with the new beta Internet Explorer version of the Google Toolbar. Firefox Bookmarks - Links to various useful free SEO tools that you can add to your Firefox bookmarks toolbar. Companies that focus on the competition too much instead of adding value to their offerings actually end up destroying their own profit margins, but almost any successful & differentiated business can drastically increase its profit margins by leveraging the above tools.